Why is it necessary to repeat the dose of pond treatments when treating for parasites? Should filters be turned off during treatments? Why is it necessary to increase aeration when treatments are added to a pond? How does salt kill parasites? Is it possible to treat dropsy (pinecone disease)? Koi health problems, an introduction. The intention of this page is to provide advice for those whose lack of experience leaves them feeling “out of their depth” in the face of what may seem to be an information overload of confusing and sometimes seemingly contradictory advice. Externally visible wounds, sores and infections are fairly easy to diagnose, even for the inexperienced pond keeper. But in the absence of externally visible signs, how do you determine if there actually is a health problem and how do you begin to tackle it? It is difficult to diagnose sick fish without the benefit of seeing them and their behaviour in any particular situation so it isn’t possible to give an exact procedure that will cover every eventuality but general good advice is as follows. Remember, we don’t keep fish, we keep water. This expression cannot be repeated too often. Koi are living creatures with an immune system that tries to keep them healthy. In good water, this system will usually be fairly successful. One part of a fish’s self defence system is a mucus layer which covers the skin and scales. It contains antiseptic chemicals and antibodies. It is continuously renewed from cells within the skin, and it’s purpose is to kill invading organisms, or at least slough them off with the excess mucus that washes off the fish as new mucus is produced underneath it. Beyond this mucus layer is the immune system itself. This is very efficient at fighting off normal levels of the invading organisms that commonly share the fish’s environment, but it can be suppressed when a fish is under stress. If a koi is very stressed, its immune system can be almost totally ineffective. In bad water, all fish will be stressed. Their immune response will be less effective and they will be at risk of contracting a disease that they would otherwise have been able to resist. There are similarities with the human immune system. Your mum was right! If, as a child, you spent a day playing in the snow without being wrapped up warm, you will catch cold. Snow does not contain the rhinovirus (common cold germ) but by exposing your body to extreme cold conditions you will lower your immune system. The rhinovirus, to which we are continually exposed, and which is normally resisted, will seize the opportunity and multiply in us, causing the runny nose etc. that we associate with catching a cold. Fish are exactly the same. If poor conditions stop their immune system from resisting infections, they will succumb. If a fish behaves unusually and there is no obvious external reason, do not immediately rush for the net and start examining it. A sick fish does not need extra stress. It may be necessary to examine it later but this should be a last resort, not the first. Do not guess what the problem could be and bung in a treatment “just in case”. The chances of correctly guessing are outweighed by the chances of doing more harm than good. Do thoroughly check your water parameters and take any corrective action without delay. Gasping at the surface, for example, may well be a sign of a parasite infection or it may simply be that the water is not well aerated. Either way, the chances of a full recovery from a parasite infection, or any other infection, are reduced if the water quality is poor. Get the water to an acceptable standard first and then see if the fish spontaneously get better or still exhibit the same signs of being unwell. 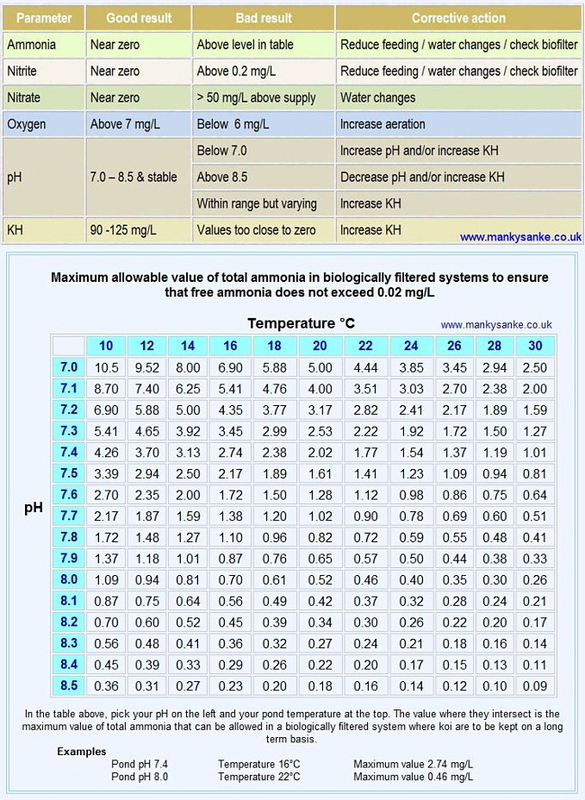 Below are charts for the parameters that should normally be checked regularly, but if this hasn’t been done and there appears to be a problem or any unusual behaviour then the minimum parameters to test are pH, ammonia, and nitrite. Oxygen should also be checked if there is any sign of the fish gasping at the surface or crowding around air stones or waterfalls. Let me emphasise that water parameters should be checked without delay and that any corrective action should be conducted promptly because water parameters may not be the actual cause of the unusual behaviour. If the parameters are within the acceptable limits as indicated on the action chart above, or once any corrective action has been completed, if there isn’t an immediate improvement then the next step is to net any affected fish. This will allow for a closer examination and a mucus scrape to be taken which can then be examined under a microscope to look for and identify any parasites that may be present so that the correct treatment can be used rather than one chosen by guesswork. The object of diagnosing the cause of a problem, up until the point at which it becomes necessary to examine a fish more closely, has been to avoid causing any stress to an affected fish. Netting, examining and scraping fish is something best conducted by, or under the guidance of, an experienced person. The aim is to ensure that no harm comes to it as a result of incorrect technique and that no undue stress is caused. Remember stress isn’t something that just annoys or inconveniences a fish - it is a “fight or flight” reaction that causes adrenaline and cortisol to be released into the blood stream. These are an advantage if a fish has to fight it’s way out of danger or, in the case of koi, to flee from it but they also cause physiological changes that dramatically reduce the immune response and correct osmoregulation. Unnecessary stress can actually be the “last straw” that causes a sick fish to succumb to an illness or, at the very least, will hamper its progress towards recovery. If you aren’t sufficiently experienced to be confident enough to undertake examining and scraping a koi then the best course of action is to get expert advice. “Proper” koi dealers usually have sufficient knowledge to correctly diagnose problems and advise the correct course of action. Avoid advice from garden centres or pet shops, unless you know that the person also happens to be an experienced koi keeper. If you are already a member of your local club, you will know who to ask. If you are not a club member, contact your local club and ask them for advice. You may be referred to someone who is prepared to help you now, and maybe even come round to look, but on the strict understanding that you will join that club at the next opportunity. All clubs are on the lookout for new members, and if you can get prompt help in exchange for joining a club (and learning even more), that’s not a bad trade. According to Defra, the minimum quarantine period should be two weeks at 23ºC to 28ºC, although they stress that this is the very minimum period and that longer would be better. It is important that the initial temperature should be at 15ºC or lower and that the koi should be allowed to acclimatise to this temperature. Raise the temperature by 1ºC per day until it is in the range 23ºC to 28ºC, (preferably nearer to 28ºC), where koi are most susceptible to the virus. Ideally raising it to the higher end of this range. Maintain this temperature for at least 3 weeks. Reduce the temperature by 1ºC per day until it is back to 15ºC. After 1 day at this temperature, repeat the process a second time. At the end of the quarantine period, before transferring the koi to the pond, ensure that the water parameters have been slowly adjusted to the pond values. Temperature cycling from 15ºC up to around 27ºC and back down again is stressful for the koi, but unless the virus crosses the boundary temperature from the inactive range to the active range, (ie around 15ºC), there is a chance that it may not be triggered into activity. This would result in a KHV infected koi mistakenly being given a clean bill of health and transferred to the pond. The virus could then lie dormant until it is triggered into its infective stage by some future circumstance. It is essential that the fish are closely monitored during the process as other diseases may be triggered. White Spot, for example, is brought on under stressful conditions. Unless treated at the earliest signs, it can cause too much damage to the osmoregulatory system for the koi to survive. It is generally thought helpful if koi that have never been exposed to the virus, (KHV naive koi), are included in the tank during the quarantine regime since these are likely to show symptoms of the disease even if the new fish initially do not. Achieving an initial temperature of 15ºC in summer may be difficult. It may be better to restrict buying of new koi until ambient temperatures allow the tank temperature to fall to this value. Or, if you do not want to miss out on the chance to buy something special that may not be available later, you could keep the new purchase in the tank until later in the year and start temperature cycling then. I have bought a new koi and, after putting it into the pond, it is just sitting at the bottom and sometimes rolling onto its side but if I try to catch it with a net it swims away and behaves normally for a while but soon returns to the bottom. What is wrong with it? The first thing to say is that I always recommend quarantining new fish before adding them to the pond in order to ensure that you don’t transfer a fish that has anything that might be contagious. (Click here for an effective quarantine regime). If a fish isn’t carrying any problems, it can be transferred to the pond with confidence. If it does have a problem, the advantages are, not only that you won’t risk infecting your existing fish, but that spotting a problem and treating it will be easier in a small, known volume of water. Having said that, if the koi is already in the pond and if it wasn’t exhibiting this behaviour before it was brought home and put into its new environment with different water parameters, such an abrupt change in behaviour is a indication that these aren’t to its liking. One possibility is that it could be pH, but there is another water parameter that is closely associated with pH, and that is water hardness; either GH or KH. The classic symptom displayed by koi that are transferred from water with low hardness to a much higher hardness is that they will sit on the bottom and sometimes roll over. If the problem is either pH or hardness related, there is no "cure" as such other than to ensure that the pH and KH are in the correct range and allow the koi to acclimatise to the new values, which it will do in time. The acceptable pH range for koi keeping is any value in the range 7.0 to 8.5 provided it doesn’t vary by more than 0.2 per day. The usual cause of variations is photosynthesis by plants, algae or cyanobacteria, (bacteria that are close relatives to algae and are sometimes called blue-green algae) and this causes the pH to be lower in the morning than it is in the evening. This variation is caused by carbon dioxide being taken up from the water by day and released by night. A small daily variation in pH is quite natural but in a koi pond it must never be allowed to exceed 0.2. Experienced koi keepers, with the aim of replicating conditions in mud ponds in Japan can run their ponds at a pH of around 7 and with their KH as low as 1 degree but this isn’t recommended for the inexperienced. If these parameters are not in the correct range, don't adjust the pH by more than about 0.2 per day or increase the KH by more than about 1 degree (17.9 mg/L) per day as the existing fish will presumably have acclimatised to the current values. Changing them too abruptly, even if this is to more suitable values, will cause them stress. The exception to this is in the case of a severe pH crash when the pH must quickly be brought up to 7.0, in order to save them from harm due to acidosis. Once the pH reaches 7.0 it must not be raised any further until the koi have had time to acclimatise and the ammonia level has been checked to ensure that it’s safe to raise the pH, (at the normal rate), to the desired value. The most important thing to do when koi are behaving unusually is to establish the cause rather than begin to treat without knowing what you are treating for. You could possibly make matters worse that way. First check that the water parameters are correct. The minimum tests to make are ammonia, nitrite, pH, and oxygen. Water parameters should always be regularly checked anyway but they should be double checked at the first sign of unusual behaviour, even if only a single koi appears to be affected, since it may just be the first to be upset by water parameters that are going out of acceptable limits. If parameters are within limits, or if they have been corrected and the unusual behaviour continues, it’s time to observe the fish. Look for sores, ulcers, fin erosion, visible parasites, breathing rate, general deportment and colour of gills, etc. It’s difficult to check gills without netting koi but it may be possible to see into their gills as they swim away from you. Gills should be ruby red and free of mucus or signs of erosion. Identifying problems while koi are swimming freely isn’t easy but it’s worthwhile spending a few minutes trying to find a reason for unusual behaviour without unduly stressing them by netting them. If water tests or observation doesn’t identify the problem and the appropriate treatment then any affected koi should be netted for a closer examination. This includes checking for all the above and possibly scraping the body (and also the gills if you are an expert) to check for and identify any parasites to complete the procedure so that the appropriate treatment for an individual fish or the whole pond can be decided. I don’t keep cod, I keep koi. If koi, or the carp from which they have been bred, preferred salt water, they would have packed their bags and moved from their lakes to the sea many thousands of years ago. Or to put it a little more seriously: All living creatures have evolved to exactly suit the environment in which they live. Fish in salt water have evolved to do best in salt water, fish in fresh water have evolved to do best in fresh water. We tamper with that arrangement at our peril, or more exactly at the fish’s peril. Salt is an excellent treatment for a range of koi ailments but it should be kept as a treatment and not used as a continuous additive to the pond. Water always tries to move from lower concentrations of chemicals to higher concentrations. It will do this until the higher one has been diluted to the same degree as the lower. Fresh water fish have a much higher concentration of chemistry inside them than in the water outside. A fresh water fish with a damaged skin will find that water is entering it through this wound. The kidney will work overtime and will expel as much of the excess water as possible by increasing the rate at which urine is expelled. If the wound is minor, it will successfully do this until the wound heals and the ingress of water stops. If the wound is more serious, the kidney may be damaged by having to work too hard, leading to additional health problems, or it may be unable to expel water quickly enough and the fish will be “diluted to death”. Exactly the opposite happens if a salt water fish has a damaged skin. The concentration of chemistry inside it is much lower than in the sea water outside. If a salt water fish has it’s skin damaged, water will flow out of it until it has diluted the sea outside to the same level. Clearly this cannot happen, there is not enough water inside a fish to dilute the sea. So the fish will die of dehydration in the process. There is a balance point. If a fresh water fish is placed in a hospital tank and salt is added so that the concentration of salt outside the fish is the same as the concentration inside it, then water neither flows in nor out. The wound can then heal in peace without the kidney having to try to work harder than normal. A salty environment is good for a fresh water fish while it has damaged skin. Higher concentrations of salt in a hospital tank can kill some parasites. (Look on treatment charts to see which ones. A treatment chart will appear here in due course). The way they are killed is like this: Remember that water flows from lower concentrations to higher. If a fresh water fish that is affected by parasites is put into a short term bath with a high concentration a of salt, then water will be drawn from inside the parasite to the higher concentration outside. This means that the parasite will dehydrate very quickly, Literally, death within one or two minutes is possible. At the same time, the fish is also dehydrating by the same process, but because of it’s much larger size it would, if left in the bath, take longer to die. The trick is to leave the fish in the bath just long enough to kill the parasites, but remove it before it suffers any lasting damage. A short term salt bath is effective at killing some parasites provided the fish is watched carefully and it is removed if it should show any sign of distress. It is impossible to tell whether a koi is thinking happy thoughts or not, but by general observation of it’s behaviour, it can be seen that if a stressed fish is placed in a hospital tank and salt is added, the signs of stress will reduce. For a fish, the first line of defence against parasites is the mucus layer. It contains antibodies and chemicals that are designed to kill invading organisms. It is continuously produced by cells in the skin. As new mucus is produced, the old mucus is sloughed off. This will also help remove any parasite that is trying to invade. Mucus production increases as a natural reflex action of the immune system when it is under attack from invading organisms. Salt will also trigger this reflex action and cause the mucus layer to thicken. This is another example of how salt can be used to help control a parasite attack. If salt works so well, why not add it to the pond as a continuous preventative treatment? It’s not as simple as that. If I have a headache, I take two Paracetamol. The headache goes away. It could be said that Paracetamol “cures” a headache. However, this is not a good enough reason to take eight Paracetamol per day, every day, in order to prevent future headaches. Too many Paracetamol can do more harm than good. Similarly salt can be used to “cure” some fish problems, but in doing so it is messing around with their osmoregulatory system and their immune system. This is acceptable for short periods in order to help cure them of an ailment, but it is far better to give them good quality water so that their immune system functions well and keeps them healthy as nature and evolution intended. Removing salt from a pond by water changes is a long process. Ten water changes of 10% each are not equivalent to a 100% change. Each 10% change only reduces the concentration that existed immediately prior to the change by 10% not the original concentration. For example, after the first change the concentration will be reduced to 90% of the original but the second change will only reduce that 90% by 10% leaving 81% still remaining. The third 10% change will reduce the 81% by a further 10% leaving 72.9% of the original amount still there. 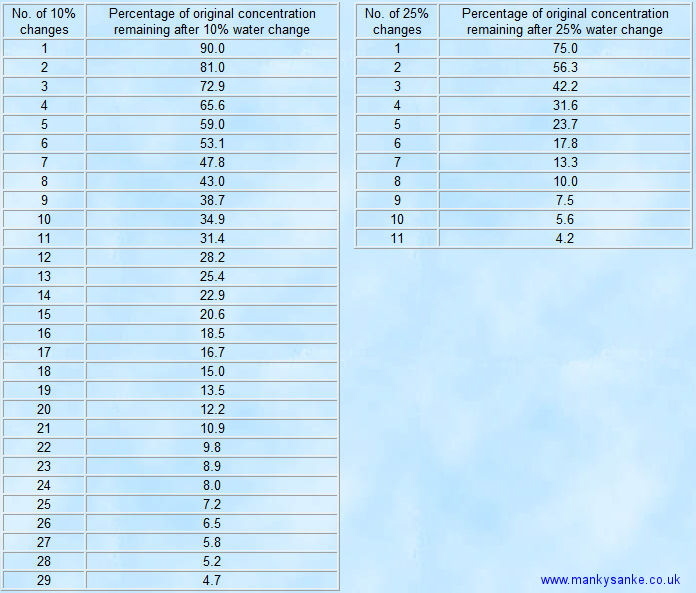 It takes twenty nine 10% water changes to reduce the concentration to below 5% of the original strength as shown in the table of 10% water changes below. Even if the scale of the changes is increased to 25% it will still take eleven 25% water changes to reduce the concentration to below 5% of the original as shown in the table of 25% water changes. This doesn’t only apply to removing salt by dilution with water changes, it also applies to any other chemical that is put into the pond that doesn’t break down or decompose of its own accord or isn’t removed by bacterial action. Why is it necessary to repeat the dose when treating a pond with medication for parasites and is timing important? Some parasites reproduce either by laying eggs on surfaces in a pond or by scattering eggs into the water. The reason for repeat dosing a pond with medication when treating for these parasites is because, although they can be killed whilst they are in the free-swimming adult stage, the treatment is usually ineffective against unhatched eggs. The first treatment will kill the adults, but then a few days later, any eggs will hatch. At this point, the original treatment may be too weak to have any effect against them. So the second treatment is to kill the new generation of free-swimming adults. The third treatment, if recommended, is "insurance" against any late hatching eggs. The timing of the second or subsequent doses is important. If the treatment is too soon after the previous dose, there is the possibility that the eggs will not have had time to hatch and the new generation will still be protected inside these eggs. When they subsequently hatch, the treatment will be too weak to be effective against them and they will be free to begin a new outbreak. Alternatively, if the second dose is delayed, there is the possibility that the new generation will have had time to hatch and to begin to produce eggs of their own. This new generation of adults will be killed by the second treatment but the eggs they have just laid will survive and will be able to begin a new outbreak when they hatch. Different parasites have different life cycles and these life cycles are dependent on temperature. It is important, therefore, to carefully follow the manufacturer’s instructions, not only for the amount that is to be used, but also for the timing for subsequent doses in order to ensure that the treatment is as effective as possible. This is very controversial. Some people will advise you to shut off the filters in order not to harm your colonies of bugs in the biological filter. The problem with this is that, if parasites or their eggs have been drawn into the filter system, they will not be killed by a treatment that is confined only to the pond. When the filters are turned back on, they will be washed into the pond to start a new outbreak. I would recommend that you leave the filters running so that any parasites in them are also killed. The bugs in the biological filter (nitrosomonas and nitrobacter) are tougher than we give them credit for. Many treatments will have some effect on them but they will soon recover. The reason that the biofilter bugs are resistant to chemical attacks that will kill off free floating bacteria is that in the biological chamber, these colonies form into a biofilm. This means that the bacteria stick themselves together with strands called polysaccharide links. These can be thought of as microscopic sticky rubber bands. There are not only the bugs that we want, but also other bugs that have seized the opportunity to set up home on the biological media. When chemicals are put into the pond water, any free floating bacteria and those that are on the fish, are exposed to the full strength of the treatment. These will be killed. 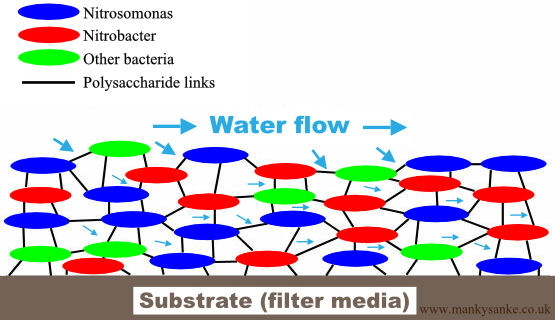 In the biofilm, however, only the bacteria near the surface will get anywhere near the full dose. The bacteria deeper inside the biofilm will be protected by those nearer the surface and also by the strands making up the film itself. The surface bacteria may be killed, but in the very competitive world of bacteria, there will be many millions just below, that will seize the opportunity to multiply and take their place. As a precaution, it is advisable to stop feeding whilst the treatment is active in the water. Some treatments, such as potassium permanganate, will have done their job and will begin losing strength within a few hours. Other treatments, such as malachite green, may last for a few days, only slowly deceasing in strength. The bacteria colony will not be functioning as normal during this time, and it may take a few days for it to fully recover. To ensure that it has fully recovered, it would be advisable to make sure that when you recommence feeding, you feed sparingly at first and carefully check the ammonia and nitrite levels. Testing every day is not too often until it is certain that these parameters are staying within acceptable limits. If the levels begin to rise, you should stop feeding and, if necessary, boost the filters to get them working at full efficiency again. Koi need a dissolved oxygen level of 7.0 to 8.0 mg/L to be active and healthy. OATA advise that 6.0 mg/L is the absolute minimum level. Koi will quickly die if the level should fall to 3.0 mg/L or lower. Many treatments, will dramatically reduce the level of dissolved oxygen in the water, so unless you know for certain that this is not the case, it is safer to assume that they all do. For this reason it is essential that high aeration should be maintained during pond treatments. High aeration is especially necessary if a fish is taken out of the pond and given a short term bath using a higher concentration of medication as is sometimes recommended. If the pond is well aerated, the dose has been accurately calculated and all other recommendations have been followed, there is very little chance that there will be a problem. However, it is good practice to keep an eye on the fish for a few hours after dosing a pond, or after adding a medication to a fish in a hospital tank, just in case they begin to show signs of distress. Chloramine T can be deactivated by dechlorinator or hydrogen peroxide. The strength of other treatments can be rapidly reduced by immediate large water changes. When topping up, use a hose pipe and dechlorinator instead of the slow trickle of a purifier, the aim is to reduce the concentration by diluting it. Draining water from the pond will not actually reduce the concentration of an overdose, it will only make space for fresh water. It is the fresh water that will dilute the treatment and so the quicker this is achieved, the better. It’s well known that a short salt dip will rid koi of many parasites but do you know how that works? Nature likes balance, so when two different concentrations of chemicals are separated by a thin membrane such as the cell walls of a simple koi parasite, the process known as osmosis causes water from the lower concentration to be drawn through the membrane towards the higher concentration. Nature is simply trying to balance the two concentrations. If there is sufficient water on the low concentration side, this process will continue until the concentrations are equal. When fresh water parasites are in fresh water their internal chemistry matches that of the water outside and a balance is achieved. 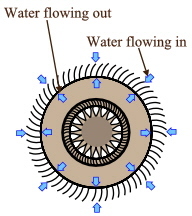 Any flow of water out of the parasite will be balanced by water flowing into it as shown in the drawing of a parasite in fresh water (figure 1). This is called an isotonic situation. If that same parasite is placed in salt water, such as when koi are given a salt bath, the balance is upset. 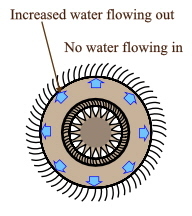 The sudden change in salinity outside the parasite isn’t balanced by equal salinity inside it so osmosis causes water to quickly flow out of it as shown in the diagram of the parasite in salt water (figure 2). Nature is trying to take water from the cells to dilute the concentration outside to the point where it balances the concentration inside. But there is so little water inside a parasite when compared to the vast quantity of water outside it that the process dehydrates it and it dies. It’s important that the parasite be suddenly exposed to a high salt concentration or it won’t be killed by the sudden loss of water from inside it. Many parasites are able to tolerate quite high levels of salt in their environment so if the level of salt was to increase slowly, the internal chemistry inside would have time to adjust to match that of the water outside. Balance would again be restored and there would be no net flow into or out of the parasite, just as in figure 1, but with a higher concentration of salt both inside and outside it. A question I’m often asked is how to treat koi with dropsy, frequently called pinecone disease. Dropsy isn’t a disease in its own right but the raised scales are usually the visible symptom of other diseases or problems that are preventing the correct functioning of the kidneys. The first point to establish is whether there is a wound or other lesion that is allowing water to enter the fish due to a process called osmosis. Freshwater fish have a much higher concentration of chemistry inside them than the water they live in and their skin prevents osmosis from causing water to enter their bodies and diluting their body fluids to the point where they would be “diluted to death”. This works very well but there is always some flow of water into a freshwater fish and so their kidneys have the job of continually expelling this water along with waste fluids by producing large amounts of dilute urine. This is natural and the kidneys easily cope with the normal amount of water that enters freshwater fish. If the skin is damaged, water enters through the unprotected area in greater quantities and the kidneys have to work harder than usual until the damage heals and the extra flow ceases. For small breaches in the skin, the kidneys will be able to cope. If the breach is large, the kidneys will be unable to expel water as fast as it is entering and the excess water that they can’t expel will build up inside the fish. This results in the extra water causing the fish to swell which causes the scales to stand out and resemble a pine cone giving rise to the alternate name; “pinecone disease”. The eyes will also be forced outward and may be seen to visibly protrude. If the skin doesn’t heal quickly enough, the continual inflow of water will either kill the fish directly or the kidneys will be damaged by the extra work. If the kidneys are damaged, even if the skin heals or the wound is subsequently medically sealed, this condition will probably be fatal anyway. 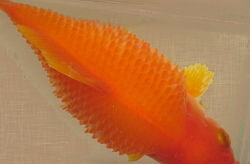 So if the reason for dropsy is that the fish has a large open wound or deep ulcer which is allowing water to enter, then the condition is treatable with a fair chance of survival if the lesion is given the appropriate treatment and then topically sealed to prevent further ingress of water until it has healed. If no lesion is present, the reason for dropsy is probably that the kidneys aren’t functioning correctly. There are different possible causes for sudden kidney failure and a common one is a bacterial infection. Antibiotic injections can help but, unless the symptoms are noticed early, the renal damage may have progressed to a state that may not be survivable. In these cases, a change in water chemistry in a hospital tank will give some chance of survival. Adding salt reduces the difference between the salinity inside the fish and the water outside it. The internal salinity is 0.9% and the salinity of freshwater is close to zero so the difference between those two is the pressure that drives water into a fish in fresh water. If the tank salinity is raised to 0.3%, the difference is one third less and the ingress of water will reduce by one third meaning that the kidneys’ workload is reduced by one third. If the salinity is raised to 0.6%, the difference will be reduced by two thirds, the ingress of water will also be reduced by two thirds and the kidneys’ workload will be reduced by two thirds. Koi are freshwater fish and shouldn’t be permanently exposed to saline conditions because long term exposure to salt interferes with the correct functioning of their osmoregulatory system. However, temporarily putting them into a saline environment will reduce the workload of poorly functioning kidneys and may buy sufficient extra time for their immune system to repair the damage before the condition proves fatal. It must be understood that this treatment doesn’t have a high success rate and it’s in the judgement of the individual koi keeper whether to attempt to treat these cases or whether to humanely euthanase the koi. If the decision to treat the fish is taken but it doesn’t seem to be producing any improvement, a second decision must be taken as to whether to continue with the treatment or accept the inevitable. If adjusting water salinity is the chosen option, the koi should be transferred to the hospital tank with the water initially at the same temperature as the pond. If antibiotic injections are to be given, the course of treatment should commence immediately. If antibiotics aren’t to be administered, Chloramine T can be added to the water according to the manufacturer’s recommendations taking into account the water hardness, pH and temperature, all of which affect the dose rate. The water should be highly aerated as adding salt will lower the amount of oxygen it can hold. The tank salinity should initially be raised to 0.3% by adding PDV salt at the rate of 0.5 ounce per gallon and the temperature raised slowly to 25°C. This degree of salinity will reduce the kidneys’ workload by one third and raising the temperature to 25°C will bring the immune system to peak efficiency. Twelve hours after adding the initial amount of salt, the salinity should be increased to 0.6% by another addition of salt at the rate of half ounce per gallon which will lower the kidneys’ workload to only one third normal. Twelve hours later, (under expert guidance), another half ounce of salt per gallon can be added to bring the tank salinity up to 0.9%. This will reduce the kidney workload to zero but it must be left to the judgement of experts in each individual case as to whether this last ditch attempt to save the koi by raising salinity to these levels is likely to be beneficial or harmful in the attempt to save it. To sum up; where dropsy is caused by a skin lesion such as an open wound or deep ulcer, there is a good chance of recovery if the lesion is given the correct treatment and then topically sealed to prevent any further ingress of water until the skin has healed. If no lesion is present then the symptom is most likely caused by a kidney infection. These conditions are frequently fatal so although transferring a fish with dropsy to a warm, saline hospital tank doesn’t have a great success rate, there are cases where it has worked and since the alternative is that the koi will soon die, the treatment is, at least, worth the attempt to save its life. Many koi keepers reach for a bottle of their particular favourite medication at the first sign that their koi are behaving in any unusual way but is this course of action the best approach to adopt? I would say not. OATA estimates that 90% of fish deaths are primarily caused by incorrect water parameters. This doesn’t mean that in every case they will have been poisoned by bad water. Some will have died as a direct result of poor water quality but the majority will have been weakened by it so that they fall victim to something they might otherwise have been able to resist. If koi look or act as if they are unwell, it’s always advisable to firstly ensure that all water parameters, especially the oxygen level, are acceptable and to quickly correct any parameter that isn’t. This may well prove to be all that is necessary. If water parameters are satisfactory and the fish still look unwell, the next action to take is a proper diagnosis before treating even if this means calling for help from a professional or someone with greater experience. Adding a treatment to the pond in the hope that it will be the right one isn’t advisable. Formalin and malachite green (FMG) is effective against a range of koi parasites but it isn’t a “cure all” treatment that is effective for all ailments. If this was the case there would be no need for koi dealers to stock anything else. As with other medications it has its uses but it also has side effects. There are sufficient indications that malachite green is carcinogenic for it to have been banned as a medication for food fish because it breaks down into a compound called leucomalachite green which persists in such tissues as their liver, kidneys and muscles long after they have been treated. There are no studies that I am aware of into whether tumours in koi can be caused by leucomalachite but it seems sensible not to use the treatment more often than is really necessary. Another effect of FMG is that it lowers the oxygen level; each 5 mg/L of formalin removes 1 mg/L of dissolved oxygen from the water. A fish gasping at the surface may be exhibiting a symptom that it has been infected by a parasite or it may simply be a sign that the oxygen level is low. Treating the pond with FMG in such a situation and lowering the oxygen level even further may be the last straw resulting in the rapid deterioration of the fish’s condition or possibly even its death. Potassium permanganate is another chemical that is frequently used at the first sign of trouble but it is aggressive and shouldn’t be used without care. In 2011, whilst in the middle of a Q&A session at a koi show, I was interrupted and a mobile phone was urgently thrust into my hand so that I could give advice to a friend of a friend who had treated his pond with potassium permanganate and whose koi immediately began dying. The person at the end of the phone was too distraught to be able to think clearly enough to properly answer the questions I asked but, from what he did say, this is what I believe was how this accident came about. I wouldn't want to add to his distress by embarrassing him but it was obvious that he couldn't recall what he had actually done or how much potassium permanganate he had added. After a few questions, it was clear that he immediately needed either a huge amount of dechlorinator or hydrogen peroxide to neutralise the potassium permanganate or a massive water change to dilute it enough to have any hope of saving any of his fish. He didn't have any dechlorinator or hydrogen peroxide and it would have taken too long to get some. Even if pumping out most of his pond and refilling would have been possible, again, this would have taken too long. The fish were dying and, in all probability, wouldn't survive but if they were to have any chance at all, they had to be taken out of that water straight away so I suggested that he get as many bowls or buckets of tap water as possible and put the fish into them. He said that he didn't have any dechlorinator or air stones so I told him to forget the dechlorinator and air stones for the moment and get the fish out of the pond water even if it meant putting them straight into undechlorinated tap water. This would not be a treatment I would ever recommend in any but the most extreme of circumstances and this really was such an emergency. It would at least give them some chance of survival and be better than leaving them in the pond where they were certain to die within minutes. I told him not to waste any more time talking and to get that done as quickly as possibly because he only had minutes to have any chance of saving any of his koi and to phone me back so I could tell him what to do next. He didn't phone back and it was obvious why. I heard later from our mutual friend that his koi were all dead even before such a desperate plan as I proposed could be put into action. There is a moral to this story, several in fact, but the primary one is something that has driven me nuts for several years since I started noticing what advice was being given out over the Internet. Some people try to look important on koi forums by pretending to be an expert but a true expert not only has the ability to understand his subject but is able to explain it in clear terms that are pitched at a suitable level for the level of understanding of the recipient. Matches are very useful but we don't give them to children who don't have the experience to know how to handle them or the dangers involved. In a similar fashion, we should all be very careful about what advice we give in the public domain or even in private where it may get passed on. There are things that we can do successfully if we understand what we are doing but which could be dangerous if attempted by the less experienced who are unaware of the consequences if these things aren't done correctly. The usually recommended way to dose potassium permanganate is to add 6.8 gm per thousand Imperial gallons or 1.5 gm per 1,000 litres. This is safe but there is a flaw. When the treatment goes into a dirty pond, some of the potassium permanganate oxidises any organic muck and is "used up". The remaining potassium permanganate is therefore at a reduced strength so it may not be sufficiently concentrated to be effective. There is a better way. Add potassium permanganate, watching an accurate redox meter until 450 millivolts is reached. Maintain that reading for 4 hours, topping up with more potassium permanganate as necessary, and then neutralise it by adding sufficient dechlorinator to reduce the redox reading back to it’s original value. Most koi keepers don't have accurate redox meters so a variation of this idea that I have seen on the Internet is to add potassium permanganate until a particular colour is just reached. (I won’t state the colour since I don’t want the idea to be picked up by the inexperienced). Maintain this colour for 4 hours, topping up with more potassium permanganate as necessary. IF YOU KNOW WHAT YOU ARE DOING, this is quite safe. From what the man said, and my best interpretation of what I could gather, I think this is what he had tried. He had seen it somewhere or had been given this advice by a self proclaimed "expert", so he just added potassium permanganate until the water was a bright _______ . Maybe just a little bit more, just to make sure. The rest is sad history. My moral; please be careful what advice you give on forums or in private. If you are not an expert, don't mislead the inexperienced by pretending to be one. By all means express opinions, we are all entitled to our own opinions but don't give the impression that your opinion is a fact. Make sure any advice given matches the understanding of the person receiving it and, if there are any risks or conditions involved, these should be carefully explained. In the UK, (my patch), in the gas or electrical industry, giving instructions or advice to anyone who doesn't know how to use it is classed as "encouraging someone to work beyond their level of competence", and is illegal. In the koi community, especially where the safety of people or the welfare of koi is concerned, some will have the knowledge or experience to use advice properly but, to the less experienced, it is the equivalent of giving a baby some matches to play with. If somebody did just that and there was an accident would it be the baby's fault or the idiot who gave it the matches? What about the man who massively overdosed his pond? Although he put far too much potassium permanganate into the pond, I don't think he could be blamed for killing a pondful of fish. It’s more likely that a self proclaimed expert, in an attempt to make himself look important, gave advice in an area that he himself didn't fully understand and that this man, not knowing any better or the dangers involved, blindly followed it.